Researchers from the University of Massachusetts Amherst have genetically developed a new bacteria strain that creates thin, highly conductive wires using natural, non-toxic amino acids. The development has been published in the recent issue of the journal Small. The team of scientists, headed by microbiologist Derek Lovley, has informed that cheap, renewable feedstock, rather than chemical techniques used for producing nanoelectrical materials, have been used to create the wires. “New sources of electronic materials are needed to meet the increasing demand for making smaller, more powerful electronic devices in a sustainable way,” says Lovley. This sustainable technology can be used to produce thin conductive wires on a large scale. These wires can also be used as capacitors and transistors in many electronic devices. Some of the applications proposed for these wires are computing devices, components of solar panels and biocompatible sensors. The discovery of an abundantly found soil microorganism, Geobacter, by Lovley and his team 10 years ago has laid the foundation for this development. This soil microorganism has the capacity to produce electrically conductive protein filaments, called “micro nanowires”, which aid the growth of microbe in the iron minerals that are present in the soil. Though the conductivity of these nanowires are sufficient for the bacterium, it wasn’t as high as that of the organic wires’ that can be synthesized by chemists. As we learned more about how the microbial nanowires worked we realized that it might be possible to improve on Nature’s design. We knew that one class of amino acids was important for the conductivity, so we rearranged these amino acids to produce a synthetic nanowire that we thought might be more conductive. In order to achieve this, the researchers used an amino acid named tryptophan that is usually absent in natural nanowires. Tryptophan, an aromatic amino acid known for inducing drowsiness after eating the turkey during Thanksgiving, can quite effectively deliver electrons at a nanoscale. We designed a synthetic nanowire in which a tryptophan was inserted where nature had used a phenylalanine and put in another tryptophan for one of the tyrosines. We hoped to get lucky and that Geobacter might still form nanowires from this synthetic peptide and maybe double the nanowire conductivity. The outcome of the research exceeded the expectations of the researchers. They were able to produce a genetically designed strain of Geobacter and create nanowires that exceed the conductivity of their natural counterparts by 2000 times. In addition, the genetically engineered models, which Lovley terms as “biowire,” measure only half the size of their natural counterparts, in diameter. “We were blown away by this result,” says Lovley. 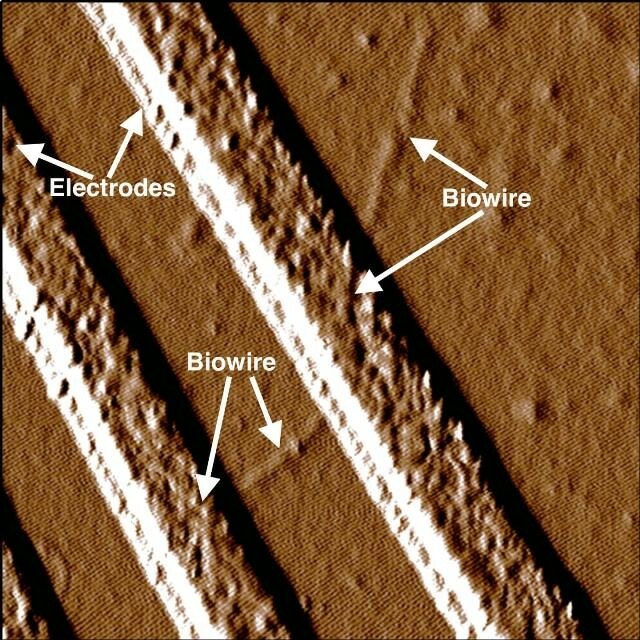 Other chemically-created organic nanowires that have the same diameter as biowire have been outdone by this genetically created wire in conductivity. The diameter of biowire is 1.5 nanometers, which is more than 60,000 times thinner than an average human hair. As such packing thousands of biowires in small spaces is no mean feat. Unlike other nanowires that require the use of toxic chemicals, biowire can be produced in a non-toxic manner and contain no toxic materials. “Geobacter can be grown on cheap renewable organic feedstocks so it is a very ‘green’ process,” he notes. Despite being produced out of proteins, the biowires are durable enough that the team could break it only after months of efforts. It’s quite an unusual protein. This may be just the beginning” he adds. Researchers in his lab recently produced more than 20 other Geobacter strains, each producing a distinct biowire variant with new amino acid combinations. I am hoping that our initial success will attract more funding to accelerate the discovery process. We are hoping that we can modify biowire in other ways to expand its potential applications. The National Science Foundation’s Nanoscale Science and Engineering Center, the UMass Amherst Center for Hierarchical Manufacturing and the Office of Naval Research have funded the research.